For all the talk of climate change adaptation, California has yet to comprehensively address the effects of warmer temperatures and changing weather patterns on the state’s limited groundwater resources. To start the process, several of the leading University of California faculty and researchers on California groundwater recently met with staff of the Governor’s Office of Planning & Research. We identified some key concerns and the information and actions needed to address them. (1) Climate change is exacerbating ongoing problems with groundwater in California, including overdraft, seawater intrusion, land subsidence and water quality degradation (Fogg et al. 1999; Fogg and LaBolle 2006; Tanaka et al. 2006; Fogg, 2008; Sager, 2012; Lund and Harter 2013). (2) Much of climate change’s impact on groundwater will be from increased groundwater pumping to compensate for growing demand and reduced surface storage, including snowpack. (Tanaka et al. 2006; Gleeson et al., 2010; Fogg, 2008; Famiglietti et al., 2011). (3) Groundwater recharge will likely decrease because of the effects of climate change, including greater evapotranspiration, more efficient irrigation systems and more stormwater runoff. (Tanaka et al. 2006; Gleeson et al., 2010; Russo et al., 2013; Taylor et al., 2013). (4) Potential changes to groundwater quality from climate change include: increased salt loading because of greater evapotranspiration during irrigation, higher concentrations of inorganic compounds and greater seawater intrusion and inundation in coastal basins (Fogg and LaBolle 2006; Harter et al. 2012; Scanlon et al. 2012; Brem et al. 2011). (5) Because of the above concerns, improved management of groundwater supplies and quality should be part of the portfolio of actions taken in response to climate change (Fogg and LaBolle 2006; Fogg 2008; Tanaka et al. 2006; Holman et al., 2011; Famiglietti and Richey, 2013; Famiglietti and Rodell, 2013). (6) Given the enormous storage space storage available in many overdrawn aquifers, enhancing groundwater recharge could be highly effective for counteracting losses of snowpack storage and greater variability in streamflow. (Fogg, 2008; Tanaka et al. 2006; Gleeson et al., 2010; Sager 2012). (7) Greater transparency and understanding of groundwater resources would improve management and policy discussions, including improved access to information on aquifer architecture (e.g. well logs), inflows and outflows, water quality and changes in storage (Fogg and LaBolle 2006; Fogg, 2008; Sager 2012; Harter and Lund 2013; Harter et al. 2012). (8) Tools for tracking groundwater reservoir storage and flows need to be more broadly applied and refined. (Fogg 2008; Gleeson et al., 2010; Sager 2012; Chou 2013; Famiglietti and Rodell, 2013). (9) More effective groundwater management could improve aquatic conditions both below and above ground (wetlands, rivers, streams, and estuaries), and could help to reduce the energy used to meet fresh water demands (Fleckenstein et al. 2006; Howard and Merrifield 2010; Sager 2012). (10) Greater understanding of the complex social and legal factors shaping groundwater use and management will be necessary for developing robust policy solutions (Glesson et al., 2010; Theesfeld, 2010; Holman et al., 2011; Taylor et al., 2013). Groundwater resources in California – and the communities, businesses, farms and ecosystems that depend on them – will be best served if improved management strategies are implemented sooner rather than later. Andrew Fisher is a professor of hydrogeology at UC Santa Cruz. Graham Fogg, hydrogeology professor, UC Davis; Joshua Viers, associate professor, School of Engineering, UC Merced; Jay Lund, professor of civil and environmental engineering, UC Davis; Ruth Langridge, researcher in environmental policy, UC Santa Cruz; Patricia Holden, professor of environmental microbiology, UC Santa Barbara. Chou, H. (2012), “Groundwater Overdraft in California’s Central Valley: Updated CALVIN Modeling Using Recent CVHM and C2VSIM Representations,” Master’s thesis, Department of Civil and Environmental Engineering, UC Davis. Famiglietti, J. and S. Richey (2013), “California’s Water House of Cards,” Op-Ed, Los Angeles Times, September 23. Famiglietti, J. S., and M. Rodell (2013), “Water in the Balance,” Science, 340, 1300-1301. Fleckenstein, et al. (2006), “River-Aquifer Interactions, Geologic Heterogeneity, and Low-Flow Management,” Ground Water, doi: 10.1111/j.1745-6584.2006.00190.x, 1-16. Fogg, G.E. (2008), “California’s Water Storage Problem, the Underworld and the Body,” The Sacramento Bee. Fogg, G. E., et al. (1999) “Groundwater vulnerability assessment: Hydrogeologic perspective and example from Salinas Valley, California.” In Corwin, D.L., K. Loague and T.R. Ellsworth, Application of GIS, Remote Sensing, Geostatistical and Solute Transport Modeling. AGU Geophysical Monograph. Fogg, G.E. and E.M. LaBolle (2006) “Motivation of synthesis, with an example on groundwater quality sustainability,” Water Resources Research (special forum on synthesis in the hydrologic sciences), 42, W03S05, doi:10.1029/2005WR004372. Gleeson, T., J. VanderSteen, M. A. Sophocleous, M. Taniguchi, W. M. Alley, D. M. Allen, and Y. Zhou (2010), “Groundwater sustainability strategies,” Nature Geoscience, 3(6), 378-379. Hanak, E., et al. (2011), “Managing California’s Water: From Conflict to Reconciliation,” Public Policy Institute of California, San Francisco, CA, 500 pp. Harter, T., et al. (2012), “Addressing Nitrate in California’s Drinking Water with a Focus on Tulare Lake Basin and Salinas Valley Groundwater,” Report for the State Water Resources Control Board Report to the Legislature. Center for Watershed Sciences, University of California, Davis. 78 p.
Holman, I. P., D. M. Allen, M. O. Cuthbert, and P. Goderniaux (2011), “Towards best practice for assessing the impacts of climate change on groundwater,” Hydrogeol. J., 20(1), doi: 10.1007/s10040-10011-10805-10043. Russo, T. A., A. T. Fisher, and D. W. Winslow (2013), “Regional and local increases in storm intensity in the San Francisco Bay Area, USA, between 1890 and 2010,” J. Geophys. Res. – Atmospheres, 18, 1-10, doi:10.1002/jgrd.50225. Sager, J.C. (2012), “Effects of Subsurface Heterogeneity on Floodplain Recharge and Subsurface Storage of Water,” Master’s thesis, Hydrologic Sciences Graduate Group, UC Davis. Scanlon, B.R., et al. (2012), Groundwater depletion and sustainability of irrigation in the US High Plains and Central Valley, Proceed. National Academy of Sci., Vol. 109, No. 24, pp. 9320-9325. Tanaka, S.K., et al. (2006), “Climate Warming and Water Management Adaptation for California,” Climatic Change, Vol. 76, No. 3-4, pp. 361-387. Taylor, R. G., et al. (2013), “Ground water and climate change,” Nature Clim. Change, 3(4), 322-329. Fixing the Sacramento-San Joaquin Delta is one of California’s highest water priorities. But high costs and entrenched interests are making progress painfully slow. Everyone knows the system is broken and faces catastrophic risks. Can the water bonds get back on the ballot in 2014? Can a flexible system that takes water from different places in wet and dry years be packaged and sold to the public? Cost: $10 non-member, $5 members, FREE for students. This program is underwritten by the S.D. Bechtel, Jr. Foundation and the Pisces Foundation and presented by Climate One in association with Capital Public Radio. This entry was posted in Uncategorized and tagged Andrew Fisher, climate change, Graham Fogg, groundwater management, groundwater recharge, Jay Lund, Joshua Viers, Patricia Holden, Ruth Langridge. Bookmark the permalink. Yogi Berra is alleged to have once said, “This is deja vu all over again”. Didn’t massive land subsidence in the San Joaquin Valley occur about a half-century ago? Markers were inscribed on buildings, telephone poles and such, reading “This is where land level once was.” Guess we didn’t learn when the opportunity to learn presented itself. World history seems to indicate that irrigated agriculture, anywhere on the planet, has a tendency to eventually collapse. California’s expanding population continues to grow and demand more water. Demand for water has increased as California farms continue to expand the planting of perennial crops primarily for export, even after water for that region was sold or transferred to southern California interests at substantial profit. From a wholistic, environmental approach, devoid of governmental bias, even the simplest minds should be able to grasp the concept that demand has increased and that no new water is being created and that storage of reserve water is inadequate. That is the actual problem that needs to be addressed. Redistribution of an inadequate supply of water is not a solution. Overdrafting of aquifers, saltwater intrusion, land subsidence and changes to water quality based upon varied water levels and or direct contamination are not new phenomena. The concept of hydraulics is not all that complex even though the physical medium upon which those forces interact may be. The reversal of gradients and flows are quite predictable based upon the laws of science and by practical observation, They occur regardless of weather patterns and political points of view. What is ironic is that there are strong, scientifically defensible reasons to expound upon the need for increased water storage and groundwater recharge. What is missing is the obvious remedy to the situation, which is politically problematic. 1)Farms in the southern Central Valley need to stop overdrafting groundwater to grow permanent crops that are inappropriate for a climate where inadequate water sources are available to sustain such farming without damaging other’s environments. 2)Less water needs to be exported from the Central Valley Basin so that reasonable groundwater recharge can occur. 3)Additional water storage structures need to be constructed (dams) so that a more significant portion of stormwater runoff can be captured for future use. 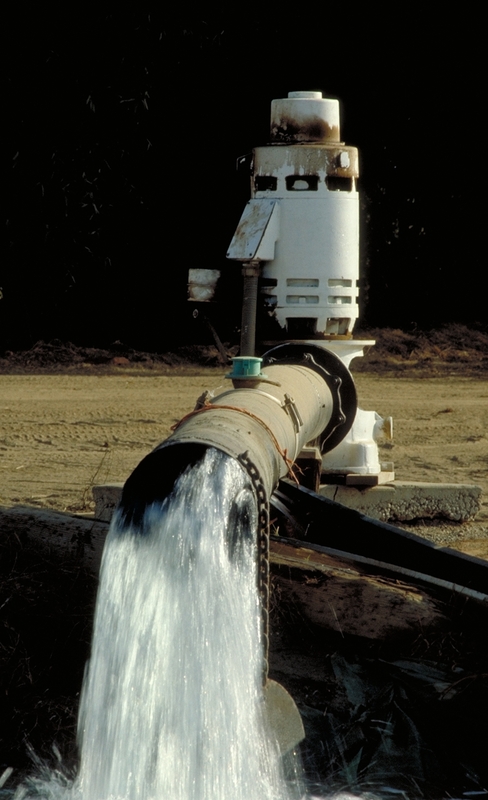 4)Archaic USACE employed flood control measures need to be abandoned in favor of mechanisms to restore groundwater recharge capability especially in southern California.5)Southern California must reduce its dependence upon other people’s water and must build desalination plants to provide water supplies for its ever expanding population. 6)Water transfers out of the hydrologic basin of origin should be disallowed from now on. AS UC Davis engineers lobby for funding of new projects with the governor’s office it should be clearly noted that the rationale has been irrationally tied to climate change which is the currency most in use for greasing political funding mechanisms. To claim a nexus with climate change or global warming is simply disingenuous based upon the facts in evidence. Weather and precipitation have continued to be highly variable and a quick study of historical records shows that is likely to continue. In fact even now, support for anthropogenic caused climate change is waning as data increasingly shows disconformity with modeled predictions. Historical weather patterns do not fit well with the engineers desire for average Q values to plug into an equation. The likelihood of a long-term dry trend for the Colorado River drainage will be extremely problematic for multiple states that depend upon that resource as water demand increases.